The "Saddlebred Sidewalk" is an exceptional way to honor your favorite Saddlebred. 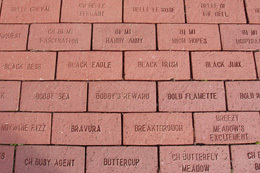 Over four thousand individually engraved bricks have been laid on the walkway to the American Saddlebred Museum. Each brick celebrates a horse or pony that has had a positive impact on their breed, in the show ring or in someone's life. ALL Saddlebreds, as well as Road Horses, Ponies, Hackney and Harness Ponies can be honored in the Sidewalk - there are no eligibility requirements. Purchase a brick for a foundation sire, past champion, broodmare, show horse or your backyard companion. A brick in the sidewalk is a permanent tribute to those horses that have earned our love, affection and respect. 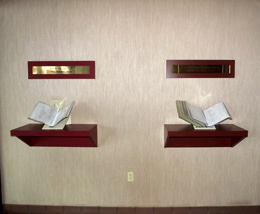 A Brick Locator Book in the foyer of the Museum lists each horse along with the donor or owner's name, city and state. Saddlebred Sidewalk Bricks can be acquired for a donation of $100.00 each; "keeper" bricks are available for $50.00 each. Keeper bricks come in two styles: an exact replica of the engraved Sidewalk brick, suitable as a doorstop or for use in a garden; and a one-inch thick paver brick with an engraved brass plate, suitable for display. Have you ever wanted to honor a person for their efforts or dedication to the American Saddlebred? The Museum "Walk of Honor" is the ideal way to show appreciation. Composed of 8" square ceramic tiles, each tile is engraved with the name of people in our industry who have been honored this way. The walk is located at the entrance to the offices of the Museum. Owners, trainers, breeders, exhibitors, industry professionals, or anyone who has a passion for the American Saddlebred should be recognized in the walkway. Surprise someone special in your life with the gift of a tile, or purchase one in memory of a person you admire. 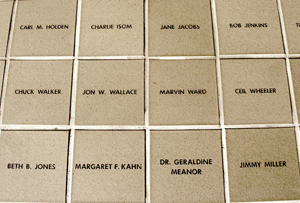 A Tile locator book in the foyer of the Museum alphabetically lists each honoree along with the donor's name, city and state. Walk of Honor Tiles can be acquired for a donation of $250.00 each. A certificate commemorating your gift can be sent to the honoree. Purchase a Brick or Tile!